Google has recently introduced a number of key features and updates to the new Google Forms. First of them is making new Google Forms the default option for Form creation. Below is a quick overview of some of the main features that have been recently added to the new Google Forms. The new Form editor provides you easy access to add-ons and scripts to use on your forms. With this new update, you will be able to see individual responses for each Form you create. This is especially helpful for providing individualized feedback to students. When you launch the new Google Forms, the first thing you will see is the templates gallery, from there you can select any template you want or click on ‘more’ button to browse through several other options. 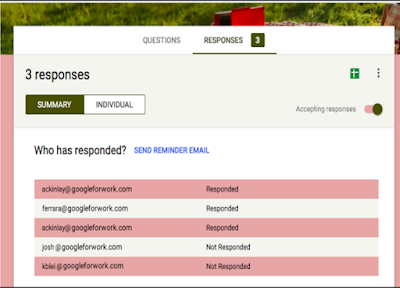 The new Google Forms allows you to activate the notification feature so you can receive email notifications whenever there is a new response to your Form. This feature enables you to keep track of how your Form is performing. You will be able to view those who have already submitted their responses, those who didn’t and even send out email reminders.